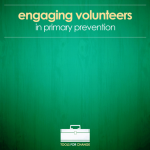 Tools for Change: Engaging Volunteers in Primary Prevention, a new resource created by the prevention team at the Texas Association Against Sexual Assault, is a valuable tool when thinking about using volunteer power to facilitate sustainable prevention work. Oftentimes, prevention work is conducted with limited resources. There may be a limited number of staff people, limited amount of time available to conduct presentations, limited funding provided to travel to all presentation locations, or a variety of other resource deficits. Creating a team of well-trained volunteers can help to increase both the quality and quantity of prevention services your agency is able to offer to your community. 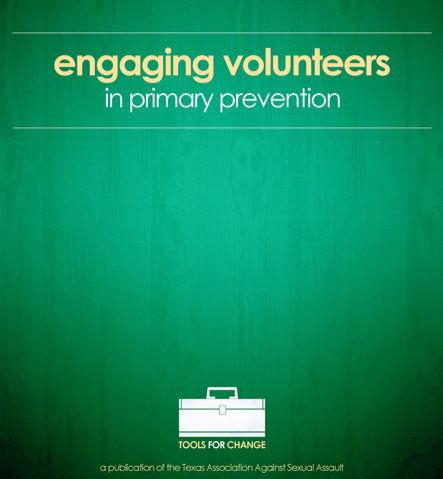 Tools for Change reminds us that recruiting the volunteers is just one piece of the puzzle. Before you move forward with recruitment, it is important to assess organizational readiness such as your ability to manage the volunteer team, give them specific tasks to meet specific agency needs, and designate resources to their ongoing training and work both in and out of the office. One of the most important pieces of determining organizational readiness is determining specific roles and responsibilities for volunteers. Giving volunteers specific duties with specialized training and outcomes may impact retention rates and overall volunteer commitment. Tools of Change also outlines recruitment strategies and ways to interview and select volunteers that best meet the needs of your agency. The resource provides templates for interview questions, assessments for organizational readiness, and questionnaires to determine volunteer roles and duties. You can check out the new resource here! For more resources from the team at the Texas Association Against Sexual Assault, click here!